Considered second only to Confucius in the history of Chinese thought, Mencius (371?-289 b.c. ), was a moral philosopher whose arguments, while pragmatically rooted in the political and social conditions of his time, go beyond particular situations to probe their origins and speculate on their larger implications. His writings constitute a living tradition in China and the world at large. Sinological studies of Mencius have long emphasized philological and archaeological research, situating the texts mainly in Chinese history. Critical appraisal of the texts lends itself to Western traditions of interpretation. In Mencian Hermeneutics, Chun-chieh Huang utilizes both approaches to offer a historical and universal understanding of Mencius.Huang builds from the premise that Mencius' thinking and all Chinese thought are sociopolitical in tone and humanistic and metaphysical in nature and range. The strength of Mencius' thought lies in the organic mutuality of these factors. His arguments are shaped by the politics, literature, and economics of his age. At the same time, the concrete programs he proposed and his sharp criticisms of alternative policies are rooted in the metaphysical soil of man and the world, human solidarity and cosmic symbiosis, and human nature within the natural world. The book is divided into two parts. Part 1 analyzes the concrete as opposed to the theoretical character of Mencius' thought. Huang demonstrates the organic unity of his intellectual system with its concepts of linkage between innermost to outermost, self to social, rightness vs. profit, and his political ideal of populist government through familial empathy. Part 2 deals with the long historical odyssey of Mencius' work in China's interpretive tradition, an exegetical process similar in its origins to Western hermeneutics.In comparing and analyzing these approaches to Mencius, Huang seeks to show that Chinese hermeneutics is more than an activity of intellectual curiosity about the ancient world, but is instead a means to sociopolitical action, an application in society of the fruits of personal cultivation. 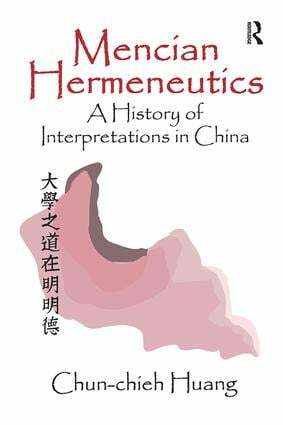 Mencian Hermeneutics will be of interest to Chinese area specialists, sociologists, literary scholars, and philosophers.